Grail Quest to find where went our productivity to? I had talked with friend, he was worried that his team was not delivering so fast that he was expected. He used to be a programmer, he is a manager today, and he remembers that “at that time” he delivers much faster, than it is delivered right now. He is confused because after all, the developer world is getting easier … He works in a company that takes time and attention to make the programmers life better: continuous deployments with the right platform, automatic monitoring and much more. And enormous number of project on GitHub, GitLab and similar. Why is this happening? Why is friend’s team productivity suffers? The problem is not trivial, it seems that today’s software engineer has everything. In addition to open source libraries, he has tools available to deliver the product quickly and in excellent quality. An extensive development environment (IDE) with support for automated code refactoring that measures its quality and prompts us to code as we type. All of this comes with tools that support continuous integration, code deployment, and support for multiple cloud environments. The developer does not have to wait weeks for a new server or software installation. To go deeper into the problem, I cite two other friends who expressed doubts in “fast delivery of the value”. The first one: after hours he works on various contracted products. Talking recently he said something that made me think. Doing after hours brings more value in one week, than his whole team together. The team is about 7 developers and we can assume that”after hours” means about 50% of the standard time of work. It means he is 14 times more productive. Puzzling! Another one during the conversation said: “You know Pedro, there is work for a few hours, unfortunately as we pass it through SCRUM, it will take us two weeks.” Hmm … again assuming that a few hours is less than a day’s work, and two weeks is 10 working days – it means we are 10 times less productive. Scary! What goes wrong? What is the problem? While the statement of the first colleague does not give us a hard evidence. The second statement clearly points to the scrum methodology. It points, that certain ceremonies or procedures cause the “same work” to last longer. Scrum is a great framework to organize and build software products, however, I have seen many times what things went wrong. What is it like? I would point out a number of distortions which, from a reasonable set of rules (eg. SCRUM), create “the RIGHT to success rules, which you must OBLIGATORILY follow, otherwise you and your project are DOOMED”. If you do not follow a “law,” you should be punished (a cap or t-shirt that reads “I was late for daily” and so on). You follow the law, you should be proud of it – you are doing (surely :/) a good job (it does not matter that the implementation delayed another week – important that you were on the planning). Applying these rules often leads to running with so-called “empty wheelchairs” where it’s important to run, because that’s what it’s all about. In this way, “accidentally” we reach the essence: the disposal of the resource (human one). Resource Efficiency principle: If you can not finish the job, switch to the next task. Do so, until you find yourself in all the time switching from task to task and/or waiting for others to finish the task you waiting for. From business owner point of view, the best utilization is when a person is working 100% of the time without a break for coffee. Once I heard from C-Level “You have to tell your people to work faster.”, but in my experience such a situation is ridiculous, as there is usually something in the system that causes the work to be slow down and the “work faster, do more, get more people” change nothing in this situation (many times things go even worser). Pretty good analogy is the highway. If there is a refurbishment works or narrowing of the motorway, more cars will only slow down the number of cars that are able to pass (work done) and increase speed is a high probability of accident and complete blocking of the motorway. 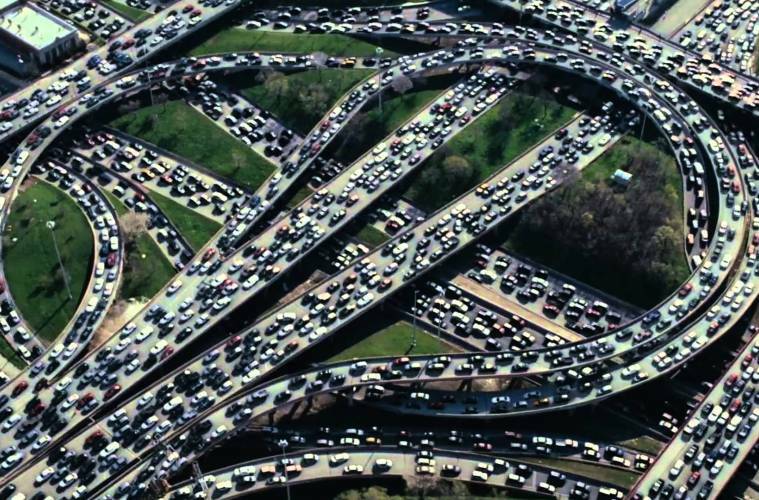 The more cars, the slower, and finally total traffic jam (business projects to be realized). Paradoxically less cars and less speed increases the throughput (work done). If worker do not work we can say that, in both situations, velocity is the same (close to zero), with quite different utilization (close to 0 versus close to 100%). The first part ends here.